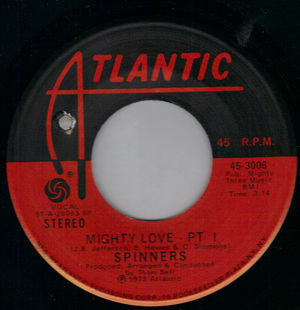 Soul Serenade: The Spinners, "Mighty Love"
The Spinners had a remarkable run of hit singles with lead singer Philippe Wynne and producer Thom Bell. It took the Spinners awhile to find success, but when they finally hit it, they became the biggest vocal group in the land during the ’70s. Although they are most well known as proponents of the Philly Soul genre, they actually got their start in Detroit, and spent several years at Motown. The Spinners formed in a Detroit suburb in 1957. They were called the Domingoes then, but that name didn’t last. Four years later (by then they were the Spinners) the group was discovered by producer Harvey Fuqua, and he began to record them for his Tri-Phi Records label. They scored an early hit in 1961 with “That’s What Girls Are Made For,” but that was about it. Several other singles failed, and a few years later when Tri-Phi was bought out by Motown, they became part of that label’s roster. They had a couple of minor hits for Motown, but big success didn’t come until they scored with Stevie Wonder’s “It’s a Shame” in 1970. Motown never had much use for the Spinners though, and by 1972 they were gone from the label. Right before they signed to Atlantic Records they got a new lead singer, and that is where their success story really started. Phillipe Wynne had sung with Bootsy Collins and with him up front, the Spinners became the biggest band in the land. Another is the string of hits was “Mighty Love” which was released in 1973. The two part record was recorded at Sigma Sound in Philadelphia with Bell producing, and MFSB as the backing band. It begins with Bobbie Smith and Wynne sharing the lead vocal duties, but pretty soon it turns into one more brilliant showcase for Wynne. “Mighty Love Pt. 1” was a major hit for the Spinners. It reached #1 on the R&B singles chart in 1974, and #20 on the Pop singles chart. In 1977 Wynne left the Spinners for a solo career. Although the group had a few more hits in the disco era, including their cover of the Four Seasons “Working My Way Back To You,” things were never quite the same. They faded from the charts in the ’80s, and became regulars on the oldies circuit. Wynne never had much success as a solo artist, but his tours with Parliament-Funkadelic are fondly remembered. He died of a heart attack in October, 1984 while performing in Oakland, CA.